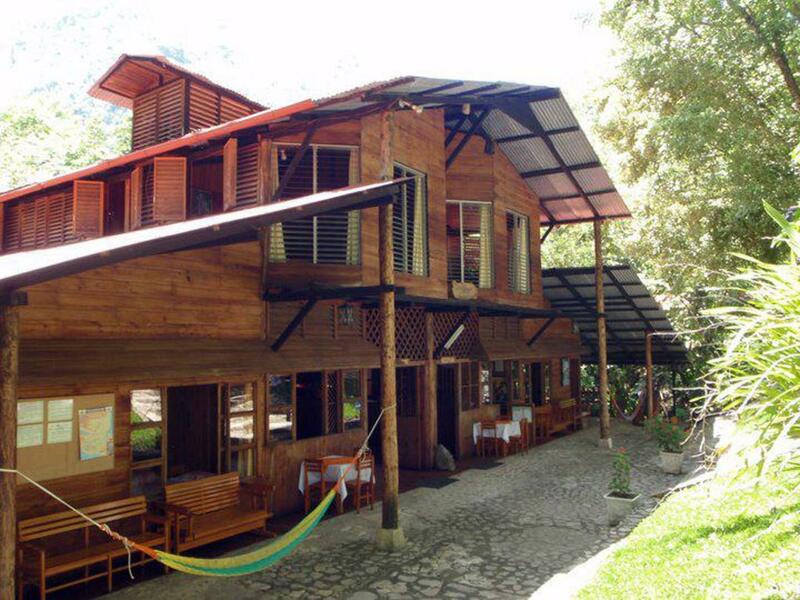 Hotel El Recreo Lanquín-Champey is set in a remote valley of Guatemala’s Central Highlands. This hotel has pleasant rooms and a swimming pool. Lanquín is the nearest town. Most travelers come to this laid-back town to check out the Lanquín Caves National Park or the natural limestone pools at Semuc Champey Natural Monument. Both attractions offer up fun places to explore the outdoors. Whitewater rafting is also possible in this area. Between your adventures, rest up in Hotel El Recreo’s hammocks, rooms, and swimming pool. This hotel strives for eco-friendly practices. El Recreo offers several accommodation options. Some rooms include private bathrooms, while others have a shared bathroom. All bathrooms have hot water. The rooms have twin, full, queen-size, or king-size beds. Rooms are simple, and sport an array of different color schemes. Some rooms come with television, and Wi-Fi is available in some parts of the complex. There are also a few cabins at the hotel. The grounds here provide ample space to stretch your legs. If you’d like to stretch them up instead of out, try laying down in a hammock. Want to swim? There’s a pool. The hotel also offers a parking lot for guests with cars. The restaurant at El Recreo serves a sampling of Guatemalan and international dishes. For breakfast, you can order pancakes with butter and honey, or you can go with eggs served alongside beans, plantains, tortillas, and cheese. For lunch or dinner, cheeseburgers and sandwiches are available, or you can try a more local dish of meat, fish, or a vegetarian option.